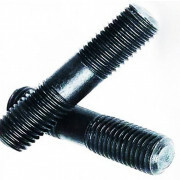 Engineers Studs consist of a length of round bar, threaded at both ends with an unthreaded plain section in the middle. The major application was the connecting of engine cylinder heads and can have different threads on each end and a different fit. Care should be taken in specifying the length of studs, the market norm is the overall length. There are many instances of nominal lengths (excluding the metal end) being given particularly on metric threads; the relevant standard gives a fixed length for the Metal end (the end that goes into the block) the other end is called a ‘Nut end’. It is prudent to confirm the lengths of the metal end, nut end and the overall length to avoid confusion.